St Margarets Junior School – Linked to St Margaret’s Church Rainham. There has been a connection to St Margaret’s Church for nearly 170 years dating back to 1846. In 1877, from the first of January, every child above 5 and under 9 years of age must be taught reading, writing and arithmetic; and no-one, not even the father or mother, may employ him or her in any shop, or in any way whatever, for gain or wages. The original National School building was erected in Station Road in 1846 and the plaque in the wall of the chimney gives credit to the Earl of Thanet who donated the site. This stone was carefully removed when the building was demolished in 1977 and may now be seen in St. Margaret’s Junior School, Orchard Street. By 1866 the school was inadequate for the number of children attending and the single storey Infants School was added at a cost to the parishioners of £507. In 1932, following the Education Acts demanding secondary education for all, the Orchard Street Secondary Modern Schools were built but by some Thirty years later Rainham had grown to such an extent that many more school places were needed. Two brand new secondary schools were built for senior pupils and the redundant Orchard Street buildings were able to undergo a thorough facelift and conversion. The old Boys’ School became the St Margaret’s C of E Junior School, and the former Girls’ School adapted into the St Margaret’s Infants School. For some years the schools were full to capacity and overflowing into huts which had to be used as classrooms, however the building of new schools at Thamesview and Mierscourt relieved the congestion and the two schools took on more manageable proportions. The Link with St. Margaret’s Church which began in 1846 continues today as classes visit the Church as part of the school curriculum and members of the Clergy regularly visit the School to take assemblies. School services are held in Church on occasions throughout the year. The PCC appoint two foundation governors to the School Governing body. Click this link to St. Margaret’s Church of England Junior School. 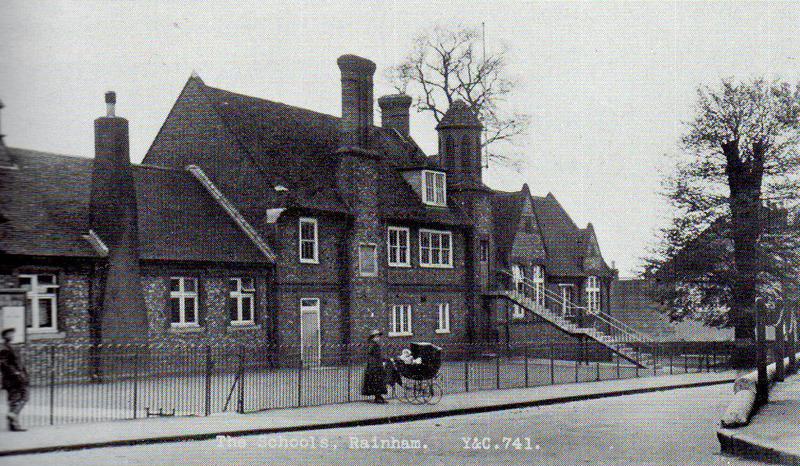 Thanks to Barbara Mackay Miller and Meresborough Books for allowing us to use pictures and text from “More Pictures of Rainham” this book is now out of print but the “Third Picture book of Old Rainham” can be obtained from Sunburst Books in Station Road. i went to the church school in the early 50 s after from the camp school maidstone rd. as a small boy i all ways loved it there the old front door into the lobby like a castle with big stone floor very dark . and mrs king as a teacher . all gone wot a shame replaced by shops ? I went to this school 1955 to 1960. Miss List joined me up with St Margarets Church choir. Mr Turner was Head Master, and I can only remember Mrs King, Mrs Evans, Mr Turton, miss Welbourne? And of course miss List. Mr Pollock was the policeman on the crossing. I have vague memories of the steps being repaired and Miss List climbing a ladder out the back to get upstairs. Absolute sacralidge that this monument was removed for a shopping centre. I adored this school. My grandparents owned Smiths sweet shop opposite! I think I might have known you Peter Adams. I went to the church school, started in Sept 1961 with Miss Rose as my very 1st teacher in the end room. I am still in touch with my best friend Sue Nolan who started on the same day as I did and we have been friends ever since. I then remember the middle class was Mrs Maddon then onto Mrs Dalton and the head was Mrs Wilkinson. The first two years of juniors are a little bit vague but I recall Mr Smith as year 3 teacher and then moving up to Orchard Street with Miss List in my last class at juniors. It was only today the other day that I was telling my eldest grandson how I got lines for spelling something wrong when with Mr Smith and had to miss a playtime. I also recall Maypole dancing in the infants playground does anyone else. As you quite rightly say a lovely old building pulled down to make way for shops! Would love to see some other stories on hear about the old school days. terry larrigan 1960 to1965 .I was a milk monitor in those days.Mr Clifford was the vicar and mr Stratton was head master taking over from mr turner. miss list was deputy head and mr Pollock was the janitor. I move to Australia in 1970 and have been her for approx47 years .would love to hear from anyone that remembers me.